Hi <>, Walking Into Spring & Beyond! Hi <>. This month let's get ready for your spring walking and beyond! Hi. It's great to be back just in time to encourage you with your spring walking and to planning for your enjoyable and rewarding summer walking. Looking back over the month of May from previous years, I recall what great fun we had when my daughters and I would join in the annual Mother's Day Walk & Run in Calgary. There were literally thousands of people of all ages particpating every year. Proceeds would go towards many worthy causes in the area. Why not go online and search for "Walking Events', "Walking Clubs", "Walking for Charity" or "Walking Activities" in your area (just add the name of your city or town after those words in the search field to get some good results for your area. I.E. "walking activities in Portland"). It should lead to some interesting possiblities for you. Another great way we enjoyed summers was family outings, beach walking, combined with summer picnics. A very special way indeed to enjoy the warmer, summer months. Whether you start your spring walking solo, with friends or with a large group, remember to start slowly especially if you have not been too active the last few months. Dust off those walking shoes and head over to our Stretching and Warm Up Exercises to help you start out on the right foot! Your body will thank you. You can fully enjoy the sensation of the warm air and sunshine to the max if you bring your body along slowly. It will get into peak form soon enough. Just don't expect it to 'be there' in the first day or two. And as you bring your finely tuned 'walking machine' up to its' full potential remember too that it's important to turn your attention to your 'walking equipment' - your feet! By now you've already picked out the best walking shoes for you, possibly more than one pair if your summer walking plans will include different types of terrain and weather. And of course if you're looking to try different walking activities, you should consider having the right type of shoe for each of those different activities. Socks can really be your 'secret' to truly enjoyable walking. If you have had a look around our site at all you know wer are totally raving fans of good walking socks and Thorlo Socks. These guys make over 50 unique TYPES of socks for specific activities. We are not talking style and colour changes here but just TYPES. So if you need socks to help you walk, hike, run, play tennis, work shift work as a nurse and so on? Well check them out. 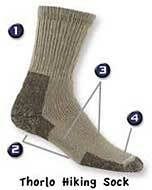 They have a differnt TYPE of sock designed specficially for what the foot needs most for each of those activities. And for our friends with arthritis or diabetes there are also special socks to help in those cases. Get in touch with us for more information on those. Eating Right- Great post! I'm glad to see that I'm already eating most of the top rated food. I hope all goes well with my favorite fitness gurus! Yes Bob, we agree totally that Eating Right is such a biggie that we can never stop paying attention to it. In fact we would like to make you aware of what can only be called a real 'game changer' in the diet and health field. It is a documentary program called Food Matters. We have watched this program several times and come away amazed, inspired and frankly rather shocked each time. It is scary just how far away from good health common sense most of the first world has strayed. The film has certainly changed our attitudes and understanding of health and nutrition!